Easter Sunday couldn’t bridge the social divide. The Sunday was not sunny and so the overcast sky blew in cool wind and good mood. 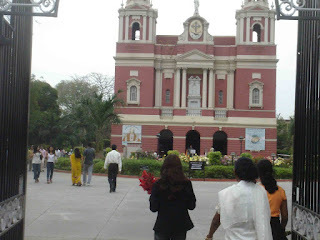 Lepers and hawkers gathered outside the iron gates of the Sacred Heart Cathedral at Central Delhi. 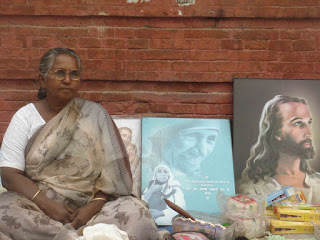 Ms. Esther was selling posters of Mother Theresa and Pope Ratzinger. Mr. Joseph, showing off his bandaged feet, was asking for money. Pious people came alone, in pairs, in families, and in groups to attend the Easter service. 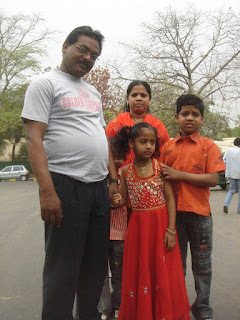 According to the 2001 census, there are 24, 080, 016 Christians in India, constituting 2.3 percent of the total population. Out of these, 130,319 live in Delhi, making up 0.9 percent of the city’s inhabitants. 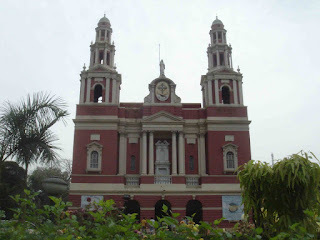 An African gentleman, blooming in floral robes, stood beside a makeshift stall selling ten rupee copies of The Guide to the Churches of Delhi. 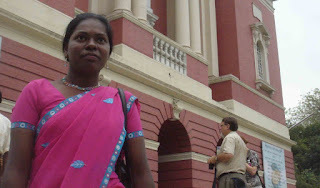 A matronly lady, in a light blue saree, requested for monetary aid in helping her cope with a cancerous ailment. 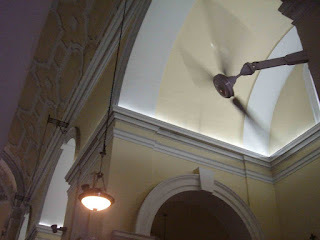 An ebony-skinned young woman in pink saree flashed a smile before disappearing inside for the sermon where the voice of the priest boomed from the tall ceiling as fans whirred lazily. During the breaks in discourse, a couple of young men and women sang hymns on an electronic keyboard. 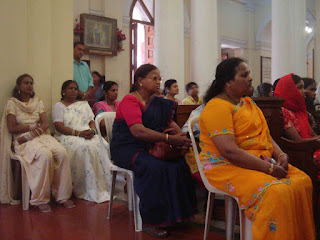 Ladies in sarees and gentlemen in half-sleeved shirts continued sitting straight with folded palms and half-closed eyes. 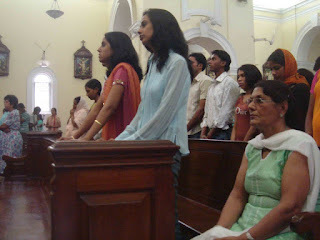 In fact the congregation appeared to be weighed down with mass melancholia. 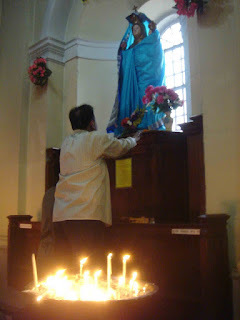 A middle-aged gentleman kneeled against the statue of Maa Mary and remained still in that position. 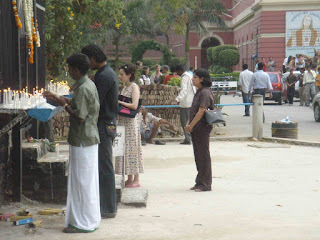 An unsmiling woman lighted candles in a corner. 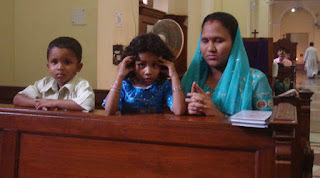 A mother on the right-side pew murmured prayers while her children chirped. An old man sitting in a corner looked lonely. 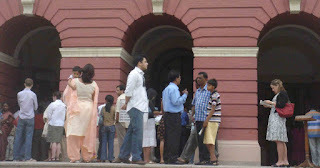 A boy in blue jeans, standing near the entrance, yawned occasionally. 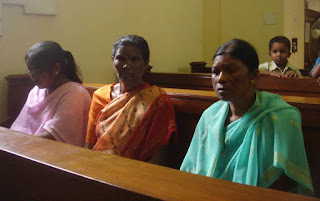 Three Malayali ladies, sitting together, looked sad. Suddenly, a white family, with a little girl carrying a white doll, stood up and left. 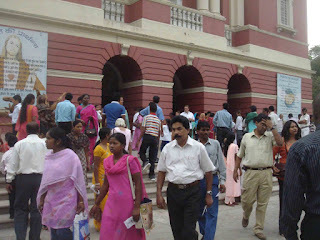 Outside, the people waiting for the English service looked hipper. Two American ladies (from Chicago and Houston respectively), their hands dyed with henna, clicked pictures. 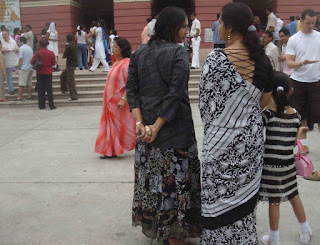 The sarees the Indian ladies wore looked expensive. 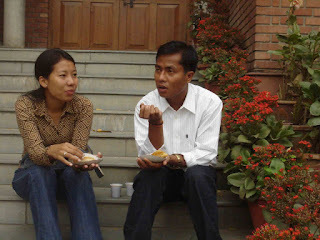 There were many young people, with Mongoloid features (which meant they hailed from the remote provinces of North East India), scattered around in casual summer clothes. Western diplomats and their families trickled in with their big cars. Some backpacker tourists too chipped in – wearing vests and shorts! Meanwhile a couple of white-robed boyish priests, looking busy, hurried past here and there. As minutes withered away, some of the waiting people sat down on the stairs while others went to a fast food stall offering samosas and coffee. Finally, when the Hindi service ended, the unglamorous people spilled out and the glamorous ones went in and they all got mixed up – briefly. I loved “hush” Mama is praying –wonderful moment you captured Mayank! Mayank i’m sure you’re seeing overtones of some sorta class-based divide, but let me offer an explanation. I hope you understand the concept of parishes and membership. Each church serves a zone and its members are registered as parishgoers with it. The ‘unglam’ congregation (as you so callously refer to) more often than not are families with members from the public sector/central government. Most of them are drawn from the broad chest of India. A largely Hindi speaking belt(barring regional languages). If you were to look around you’d see that you’re awfully close to Mandir Marg, with its dense clusters of government quarters. It’s not rocket science. You can see the colonies under the parish in a notice right outside the church. The notice board to the right. 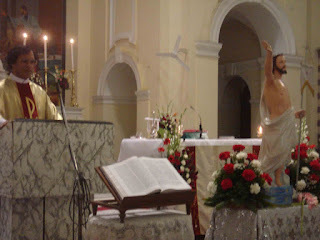 The English mass is frequented by english-medium educated people. And before anyone says it only goes to show that fluency in English (or the lack thereof) is an indicator of socio-economic status. Just wait and attend the Malayalam mass, you’ll most certainly see a healthier(according to your definition) mix of people and attire. I think its more to do with language preferences. This ‘disparity’ you seem to notice and describe is heightened when the swarms of two-timing Christians come in. They’re called two timing because (with good reason), they pop in only on Easter and then on Christmas. Most of them without a parish. They throng to the largest beacon they can see.